The company emerged from six finalists Tuesday to receive a $25,000 cash prize as part of a contest held in conjunction with the 2014 Indiana Life Sciences Summit at the JW Marriott hotel in Indianapolis. The winner also receives business planning and early strategic support from the Indiana Seed Fund II, as well as the opportunity for more exposure by making a presentation to the fund’s investment committee. “Since (our) drugs do not directly block the normal brain chemical message mechanisms, they will not cause sedation, memory problems and motor difficulties such as balance, walking and driving. So we think the effectiveness of these medications will be much greater.” said Shekhar, associate vice president for university clinical affairs at IU and director of the Indiana Clinical and Translational Sciences Institute. "Our team is extremely pleased to win such an honor, especially given the rigorous evaluation process and the promise held by the other finalist companies as well. This award will play a key role in helping to advance our technology development and offers additional avenues to reinforce our strategies as we prepare to enter the market." One in seven Americans -- in cases that range from child abuse, domestic abuse, and sexual assault to the trauma faced by soldiers, police, and firefighters -- will battle post-traumatic stress disorder at some point in their lives. Current medicines work for only half of the 24.4 million Americans who suffer PTSD at any given time and they see only 30 to 60 percent improvement in their symptoms, he added. Along with the NIH and Biocrossroads funds, Anagin will receive $50,000 in matching funds from Elevate Ventures, a nonprofit organization that provides state dollars to promising, early-stage entrepreneurs who have received funding through small business grants. For more on Anagin, visit the IUPUI Newsroom website. An international team, led by scientists at the IU School of Medicine, recently reported in the journal Nature Biotechnology that they have developed a technique to jump-start the body's systems for creating blood vessels, opening the door for potential new treatments for diseases whose impacts include amputation and blindness. The researchers are targeting new therapies for illnesses such as peripheral artery disease, a painful leg condition caused by poor blood circulation. The disease can lead to skin problems, gangrene and sometimes amputation. Although body has cells that specialize in creating and repairing blood vessels and creating new ones, these cells can lose their ability to proliferate into new blood vessels as patients age or develop diseases, such as peripheral arterial disease. However, study researchers now report they have developed a potential new therapy through the use of normal adult cells that have been "coaxed" via laboratory techniques into reverting into the more primitive stem cells that can produce most types of bodily tissue. Overcoming another hurdle that has been faced by scientists in the field, the research team found that the cord-blood-like endothelial colony-forming cells grown in laboratory tissue culture expanded dramatically, creating 100 million new cells for each original cell in a little less than three months. The leader of the research team is Mervin Yoder, M.D., Richard and Pauline Klingler Professor of Pediatrics at IU. Additional IU researchers on the study are Nutan Prasain, Man Ryul Lee, Sasidhar Vemula, Jonathan Luke Meador, Momoko Yoshimoto, Michael J. Ferkowicz, Alexa Fett, Manav Gupta, Brian M. Rapp, Mohammad Reza Saadatzadeh, Michael P. Murphy and Hal E. Broxmeyer. For more information, visit the IUSM Newsroom website. Jerome Adams, M.D., MPH, assistant professor of clinical anesthesia at IU School of Medicine, was named commissioner for the Indiana State Department of Health Oct. 8 by Gov. Mike Pence. Dr. Adams also serves as a staff anesthesiologist at Eskenazi Health, where he is chair of the Pharmacy and Therapeutics Committee. Previously, he served as a general anesthesiologist at Ball Memorial Hospital in Muncie, Ind., and as a physician rapid responder at Indianapolis Orthopaedic Hospital. He is a graduate of the University of Maryland, where he earned his undergraduate degree; the University of California, Berkeley, where he earned his Master of Public Health; and the IU School of Medicine. Mark W. Turrentine, M.D., has been named the first holder of the John W. Brown Chair in Cardiothoracic Surgery, effective Oct. 1. Dr. Turrentine's new faculty title will be John W. Brown Professor of Cardiothoracic Surgery. He will retain his current title of professor of surgery. Dr. Turrentine joined the IU School of Medicine in 1991 as an assistant professor of surgery. He was named an associate professor of surgery in 1998 and a professor of surgery in 2004. He has also served as the director of pediatric cardiac transplantation at Riley Hospital for Children at IU Health since 1991. He is also currently the interim chief of cardiothoracic surgery at the IU School of Medicine. Dr. Turrentine holds a medical degree from the University of Kansas School of medicine and an bachelor's degree in biology and chemistry from Southwestern College. He served an internship in general surgery at the University of Kansas, followed by residencies in general surgery and cardiothoracic surgery at the University of Kansas and IU School of Medicine, respectively. He also served fellowships in cardiothoracic surgery at Texas Heart Institute and pediatric cardiac surgery and cardiac and pulmonary transplantation at the IU School of Medicine. The John W. Brown Chair in Cardiothoracic Surgery was established in 2013 by multiple donors in honor of the long-time chief of cardiothoracic surgery. It is the intent of the donors that the holder of the chair will be a faculty member in the Division of Cardiothoracic Surgery, Department of Surgery, at the IU School of Medicine. IUSM student are sought to register for the 2014 Leadership Day from 8:30 a.m. to 3:30 p.m. Saturday, Oct. 25, in Fairbanks Hall, Room 1110-1112. This free event includes speakers and team building activities designed to develop medical students’ leadership skills. Speakers include Stephen Bogdewic Ph.D., executive vice dean and Dr.
George W. Copeland Professor of Family Medicine; Antwione Haywood, Ph.D., an academic specialist and assistant dean of medical student affairs; and Carla and Marc Drizin of Ignite, a human resources consulting firm in Carmel, Ind. Alice Chen of the Teacher-Leader Advocacy Committee will also hold an informal Q-and-A session. The event will conclude with a service project at Riverside Park from 1:15 to 3:15 p.m.
Breakfast and lunch will be provided. For more information or to register, visit the IUSM Medical Student Council's website. This event is presented by the IUSM Medical Student Council with support from the IUPUI Student Organization Grant. If you have questions, contact Annalise Almdale, vice president of the Medical Student Council, at aalmdale@iupui.edu. The IU School of Medicine seeks a visionary academic leader to serve as executive director of the Stark Neurosciences Research Institute. The successful candidate will have a strong background in academic leadership, research and teaching. Experience should include evidence of building diverse collaborations and teams, innovative problem-solving, strategic vision-setting and transformational leadership in academic medicine. Candidates should possess an M.D., Ph.D., or M.D./Ph.D. and have a strong, active neuroscience research program. Neuroscience research has a long history of excellence at the IU School of Medicine. 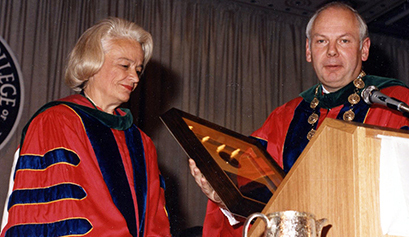 In 2000, Paul Stark and his wife Carole provided the school with a $15 million bequest to endow a multidisciplinary neurosciences research institute. Their goal was to enable rigorous investigations of normal and abnormal function in the central nervous system using the most advanced technologies and to apply the resulting discoveries to the treatment of devastating neurological disorders. The Stark Neurosciences Research Institute is now home to several highly productive neuroscience research groups focusing on addiction, anxiety, spinal cord and brain injury, motoneuron injury and disease, neuroimmunology and pain. In addition, it coordinates two internationally recognized research centers funded by the National Institutes of Health focusing on: (1) Alzheimer's disease and (2) alcoholism. Partnering with industry, SNRI interacts with Eli Lilly and Company focusing on the development of drugs for neurological disorders at their headquarters here in Indianapolis, Indiana. In addition, there is a strong program integrating neuromusculoskeletal biology between IUSM researchers and VA investigators at the Richard L. Roudebush VA Research Service. IUSM has positioned itself to be a leader in the neurosciences through committed resources, supportive leadership and partnerships, and the addition of two new buildings. The IU Neurosciences Research building, which opened in the spring of 2014, is home to IUSM scientists conducting studies in fields such as neurotrauma, dementias, neurodegenerative diseases, epilepsy, addiction and pain. The 138,000-square-foot research building adjoins, and on three floors is connected to, Goodman Hall, the ambulatory care and imaging facility of the IU Health Neuroscience Center. Co-located in the IU Health Neuroscience Center are colleagues in Neurology, Neuroimaging, Neurosurgery, Physical Medicine and Rehabilitation, and Psychiatry. The resulting 408,000-square-foot center provides a modern, expertly designed space for collaboration and innovation by physicians and researchers that is rare, if not unique. It also offers important opportunities for educating future scientists and physicians. IUSM has nine campuses across the state, educating the nation's second-largest medical student body. Our clinical, research and education partners (most within walking distance) include IU Health, Eskenazi Health and the Richard L. Roudebush VA Medical Center. The main campus is in Indianapolis, the 12th largest city in the United States, which is growing and thriving economically due to a strong corporate base anchored by the life sciences. Indiana is home to one of the largest concentrations of health sciences companies in the nation, which contribute over $44 billion annually to its economy. The vibrant downtown is a bustling commercial center, entertainment destination and residential neighborhood. The expanding residential base is driven by rich amenities and quality of life – the city is home to a variety of professional sports, arts venues and outdoor recreation areas. Candidates interested in this leadership opportunity should visit the IU School of Medicine's faculty jobs website to apply. Please include one PDF containing the following: (1) a short letter of interest noting key leadership experiences and/or approaches and (2) a curriculum vitae. The priority application review deadline is Monday, Nov. 24. IUPUI Campus Health is currently offering free flu shots to IUSM faculty, staff, house staff and students during the 2014-2015 flu season. Faculty, staff, house staff and students can obtain a flu shot at Campus Health (Coleman Hall, Suite 100) or a Campus Health outreach flu vaccination clinic. Students only can also obtain a flu shot at Campus Center Student Health. No appointment is necessary. All individuals must present a valid university picture ID to obtain a flu shot. Students will be asked to present a health insurance card but will be able to receive a free flu shot regardless of whether or not they have health insurance. IUSM faculty, staff, house staff and students who provide clinical care to IU Health or Eskenazi Health patients, perform clinical research at IU Health or Eskenazi Health, or whose primary office is in an IU Health or Eskenazi Health are again required to receive a flu vaccine this flu season. The deadline for receiving the vaccine is Nov. 21. IUPUI Campus Health is charged with tracking flu shot compliance for IUSM house staff and students. Flu shots received from Campus Health will automatically be tracked. House staff and students who opt to receive flu vaccination from IU Health, a personal physician or elsewhere must submit their flu shot consent form to IUPUI Campus Health at healthsv@iupui.edu or via fax at 317-278-6929. A complete list of flu outreach clinics, including sites at the IU School of Medicine, is online. 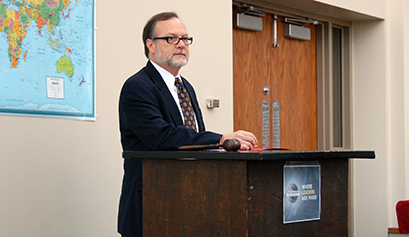 "Ebola: 'Over There'… Now 'Over Here' -- An Urgent Conversation About Ethics, Law, Public Health and Practice," will be from 1:30 to 3:30 p.m. Friday, Oct. 24, in the IU Robert H. McKinney School of Law, Room 375. This is a free event, but registration is required. Light refreshments will be served. For more information, visit the IU Robert H. McKinney School of Law's website. In response to the current outbreak of the Ebola virus in West Africa, IU recently presented an educational forum to raise awareness on campus and in the community, and to highlight IU’s connections in the region, especially in Liberia. The program, which took place Oct. 13 in Whittenberger Auditorium in the Indiana Memorial Union in Bloomington, Ind., discussed panelist on the medical, public health and physiological aspects of the Ebola virus; provided a cultural context for the response in Liberia; addressed methods for controlling the outbreak; and considered next steps in global public health. Other participants were Charles Reafsnyder, a retired associate vice president for international affairs at IU, and Ruth Stone, the Laura Bolton professor of folklore and ethnomusicology at IU Bloomington and a scholar of Liberian music, culture and performance. Michael Reece, associate dean of the IU School of Public Health-Bloomington, moderated the discussion. The forum is available via an archived video stream.